PALEO JAY SMOOTHIE CAFE: Paleo Golf! 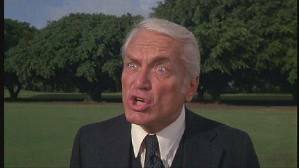 Actually, golfing is a wonderful, paleo-esque activity! Really! 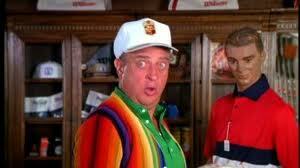 and witch- doctor Ty Webb (Chevy Chase)... you get the idea! Bushwood Country Club is a Paleo landscape! 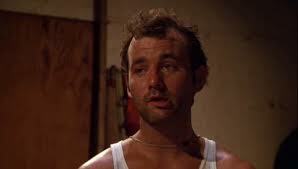 Carl (Bill Murray) is a caveman, right on the country club scene! And then, after a long, arduous (sort of) game of golf, you go to the clubhouse for a big feast of prime rib or it's equivalent! 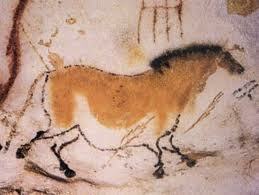 So, why is there no mention of golf in Paleo discussions?? Golf is IDEAL for this!! There, I said it. 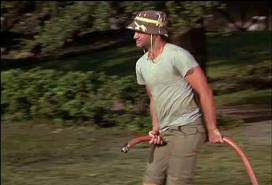 But, before you imagine me playing loud "Caddyshack" music from my golf bag, ala Rodney Dangerfield, and buying a plethora of "Naked Lady tee's", let me stress that I have some definite golf training ideas that Rodney, not to mention Judge Smails would not agree with!! OK, you have a normal golf "swing", right? The normal, "Transformetric" "Visualized resistance", Maxalding or "Dynamic tension"; whatever you call it-these exercises will dramatically increase your strength... and your overall golf game!! Getting stronger, NATURALLY, will not only help your health, but will REVITALIZE your GOLF GAME!! Just swing from the other side! Yup, if you are right-handed, practice swinging from the left side! BUT, do it slowly, VISUALIZED, with resistance being generated from within, TENSING the muscles of the swing as you go! Then, do it the right way, using your dominant (either right or left side depending), and also use the visualized resistance; making it hard, and flexing the working muscles intentionally. 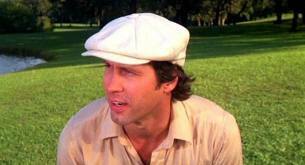 But will turn you from a Judge Smails wannabe to..
A Ty Webb(Chevy Chase) golfing guru!! Even Carl will be impressed! !